Concept 2 for the trailer system is a diagonal square tube reinforced by the thwart accepting a single strong 'stinger' with the trailer wheel axle socket attached to it. There would be a plug to fit in the hole during sailing. 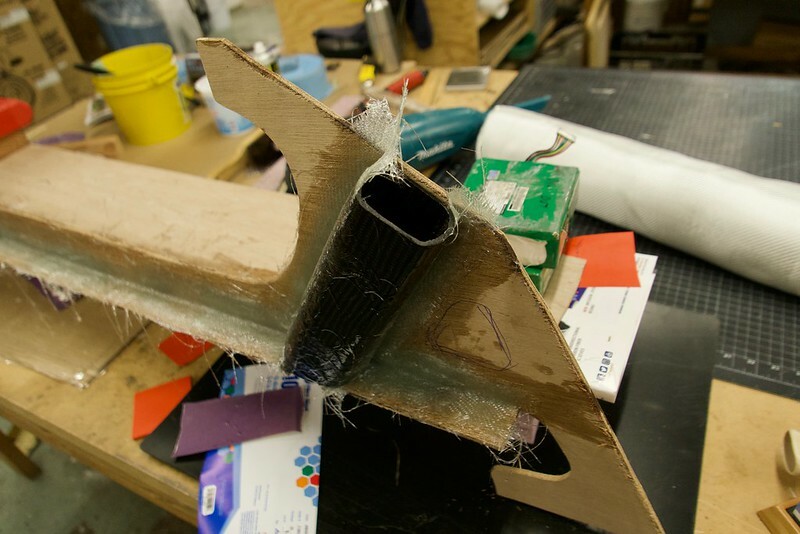 Downside is that there's a 2" hole in the hull on each side at the opening of the receiver tube. Benefit is that it's strong and simple. Even if the plug falls out, water won't come into the boat if the tube is sealed at the thwart. Now planning to create a half frame that both supports both the thwart and locks in the receiver tube for the trailer stingers. The plans show a lower profile timber frame for the thwart on the forward side. This would fine if the only load was people sitting, but with the stronger twisting force of the trailer wheel I think it needs more shear support. Last edited by fossilfool; 04-12-2019 at 10:42 AM. 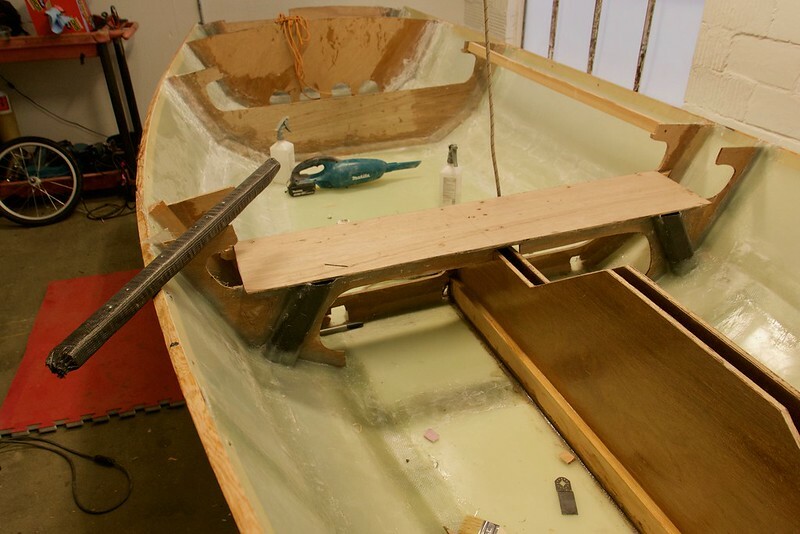 The latest is that I created a carbon-over-douglas fir stinger bar, out of which I'll cut two trailer stingers, that will insert into receiver tubes in the hull. I then wrapped the stinger bar in some padding (in white below) with packing tape as a release, then built up 10 layers of Soller Composites carbon sleeving (medium weight) to create a carbon tube with a generous 1/8" wall thickness. I cut a 2nd Midships Web Frame to make the Thwart area into a robust box structure. 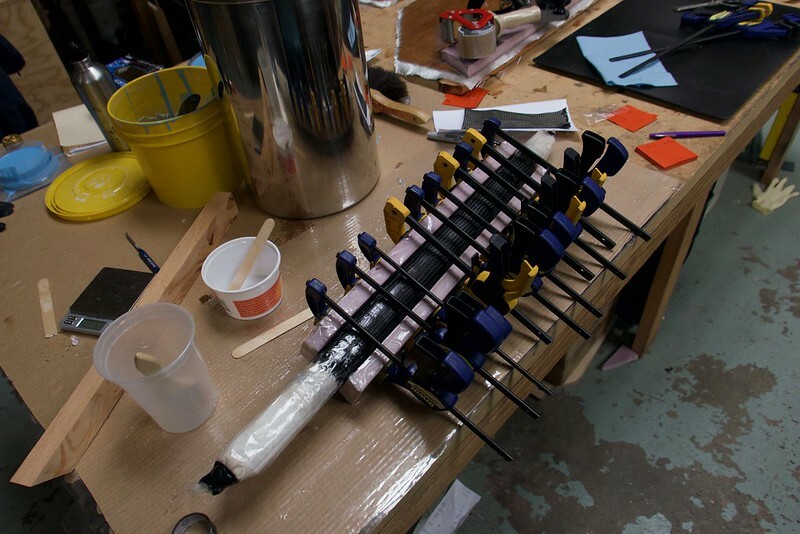 I tacked the carbon receiver tubes to the web frame with 5 minute epoxy, then locked them in with glass. Installed and welded to the hull. There's a small gap at the top that I might use for a latch, or just seal. With strong magnets I could seal it and have a waterproof latch of sorts. Trailer wheels will stay in mostly by gravity while rolling. After getting to the dock the wheels and their stingers get removed. At this point I'll plug the receiver tubes with a custom rubber plug so there's no drag from the hole. At this point most of the bike-specific work is over. I still have to finish the stingers but not a lot of work there. 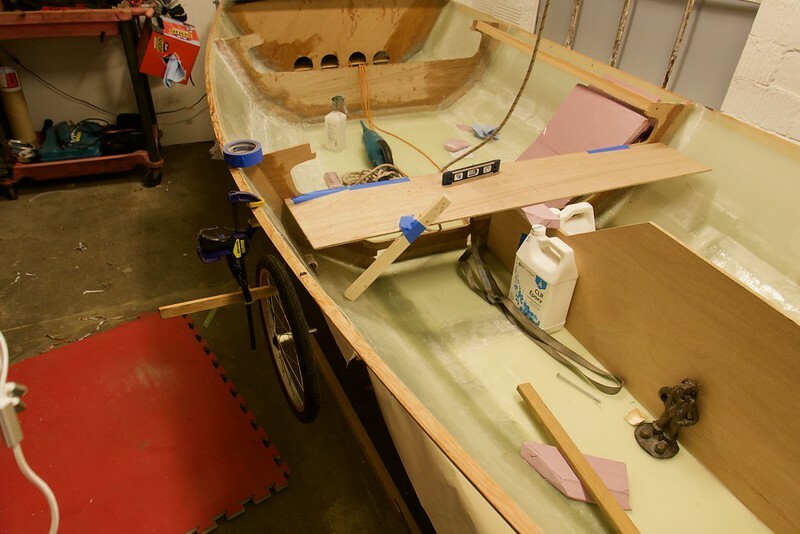 And make a towbar / bowsprit thing, not too hard. Wider view of the Midships Web Box with carbon fiber wheel sockets. The rod resting on top will be cut into the two stingers. Very neat. 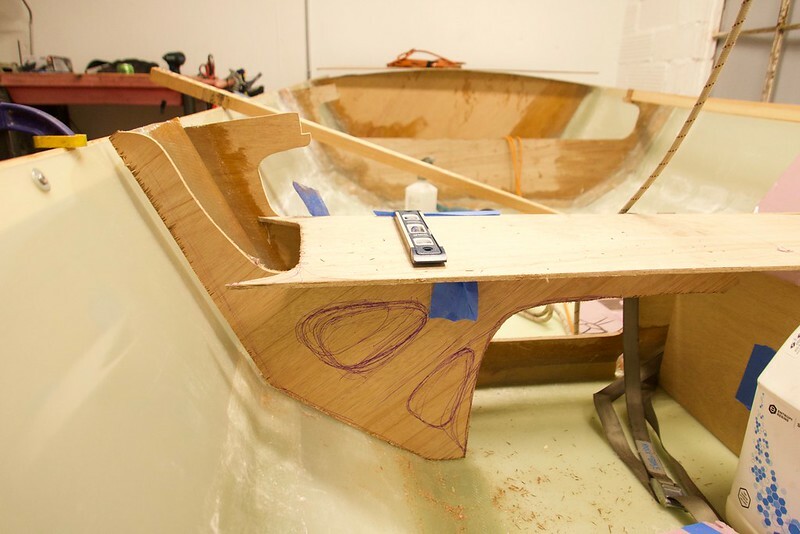 As a fellow Bay Area boat builder, I appreciate the design brief you're working toward. Can't wait to hear how she does in the bay! Be careful out there. Thank you. Will keep you posted. Nice work on the hatch. Will you add some gasket material to make it water tight? There's the plan, then there's what actually happens. Thank you. I pressed the hatch lid down on the hatch flange with thickened epoxy (using packing tape as a release). It's an exact fit, like a ground glass chemistry stopper. Not planning to use a gasket. I made a similar hatch on my Banshee and it works well. Late to the show here. I like bikes and boats and using both together so this is cool. 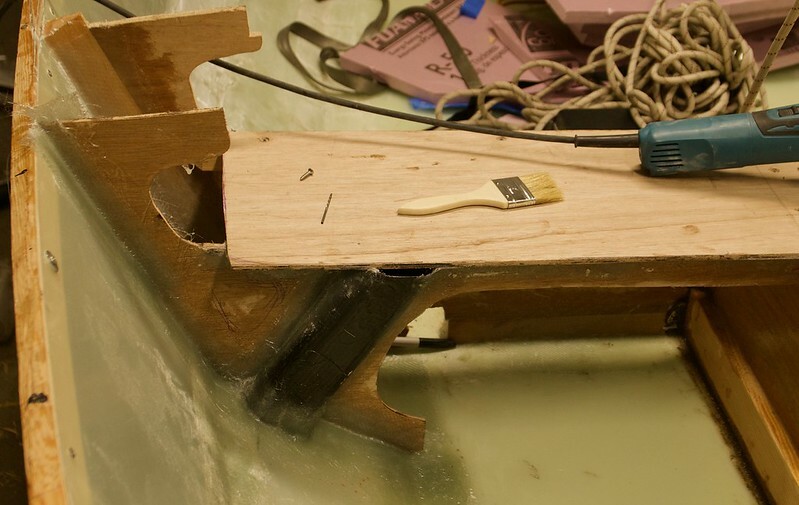 I have used G-10 and other garolites as limited structural parts in an otherwise wooden boat. 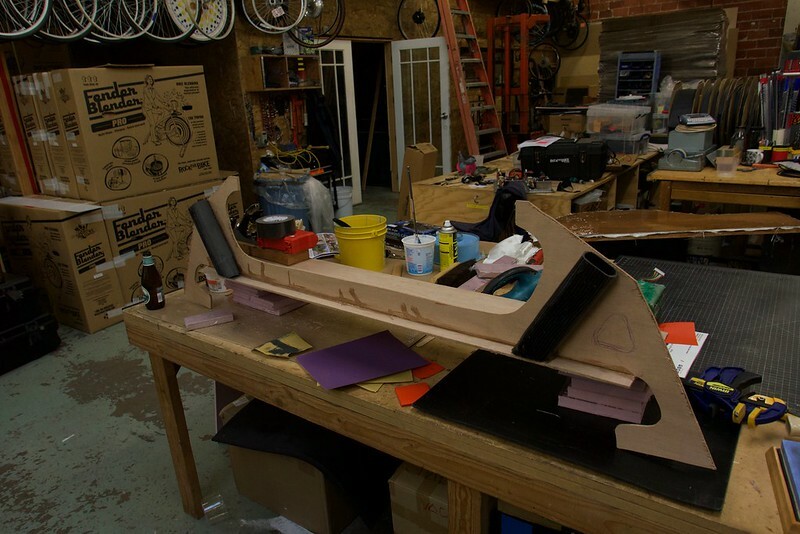 If I saw this from the beginning would probably have discouraged you, the G-10 has such a high weight for the stiffness (and is so expensive), but you had the material and know how to make it work. The 1/16" seems almost like skin on frame, sort of between plank and skin material. That's why it's so flexible between frames, and might need a little more framing. 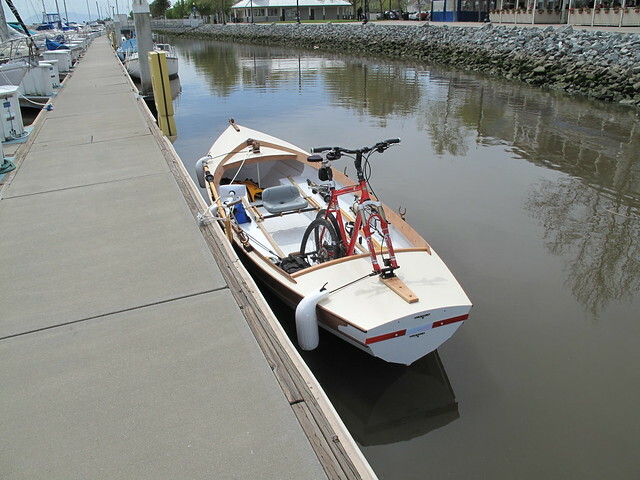 My 250 lb wooden skiff carries a bike, I use it for trips on the Bay and Delta where there is a water and land connection between two places. I can row the water part, get on the bike and ride back to the car, then drive back for the boat. I did make a wheeled dolly to try towing the boat with the bike. With added gear for a trip the towed weight got well over 300 lb, and I was discouraged at doing this for any significant distance or any hills. Looking forward to seeing how this turns out.